See in Glossary is constructed from its graphical elements. The Frame Debugger window (menu: Window > Analysis > Frame Debugger) shows the drawcall information and lets you control the “playback” of the frame under construction. See in Glossary, that object will be highlighted in the main Hierarchy panel to assist identification. See in Glossary’ when building. Note for Desktop platforms: be sure to check ‘Run In Background’ option before building, otherwise, when you’ll connect Frame Debugger to player, it won’t reflect any rendering changes until it has focus, assuming you’re running both Editor and the player on the same machine, when you’ll control Frame Debugger in Editor, you’ll take the focus from the player. At the top of the information panel is a toolbar which lets you isolate the red, green, blue and alpha channels for the current state of the Game view. Similarly, you can isolate areas of the view according to brightness levels using the Levels slider to the right of these channel buttons. These are only enabled when rendering into a RenderTexture. See in Glossary stage, due to how GLSL shaders work. In the editor, thumbnails for textures are displayed too, and clicking on them highlights the textures in the project window. You could also use external tools to debug rendering. 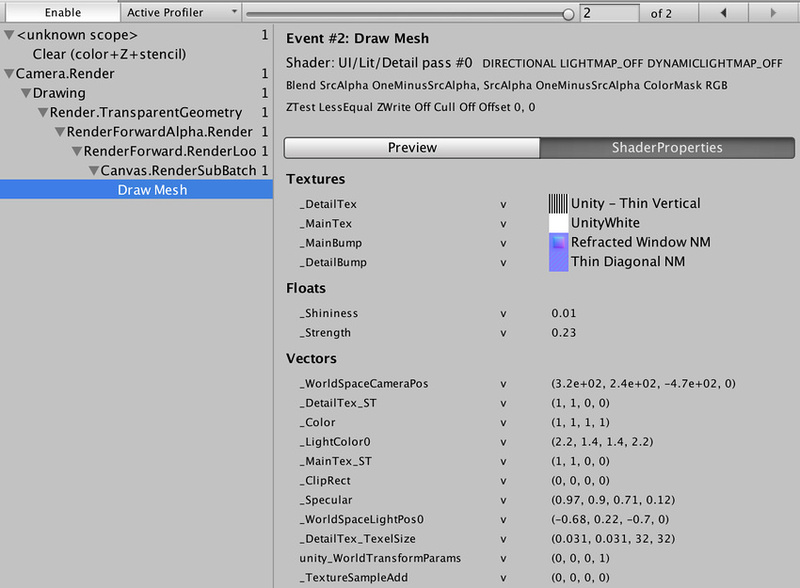 Editor integration exists for easily launching RenderDoc to inspect the Scene or Game view in the Editor. When you’ve done this, capture a frame of rendering, then step through the draw calls and other rendering events to see what’s going on. This is a very powerful approach, because these tools can provide you with a lot of information to really drill down.